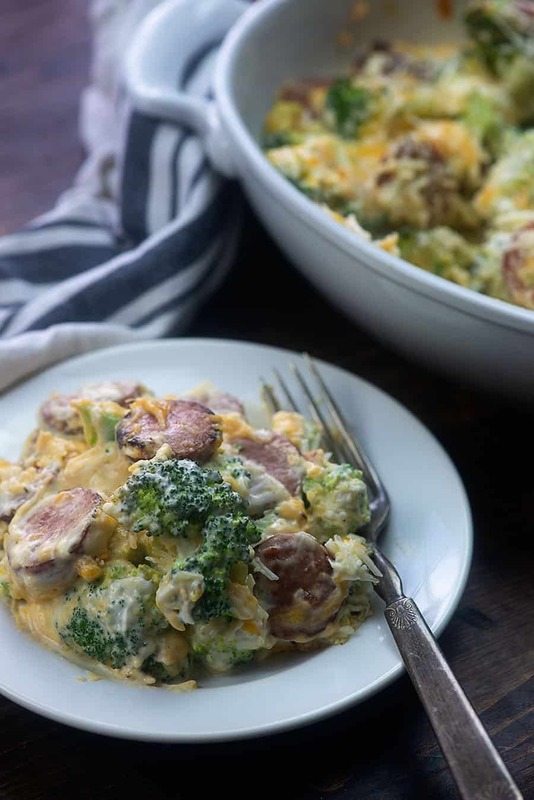 This broccoli cheddar casserole with smoked sausage is extra cheesy, bursting with flavor, and a quick way to get dinner on the table! My dad was always a huge fan of smoked sausage when I was a kid and I was honestly just kind of weirded out by it. Like, was it just an overgrown hot dog? Why are you slicing it up and putting it in things? What is even happening? Then I grew up and decided that smoked sausage is one of my favorite things ever because a) it tastes good and b) it cooks in about 2 minutes and I’m a busy mom who’s just trying to get dinner on the table as easily as possible. 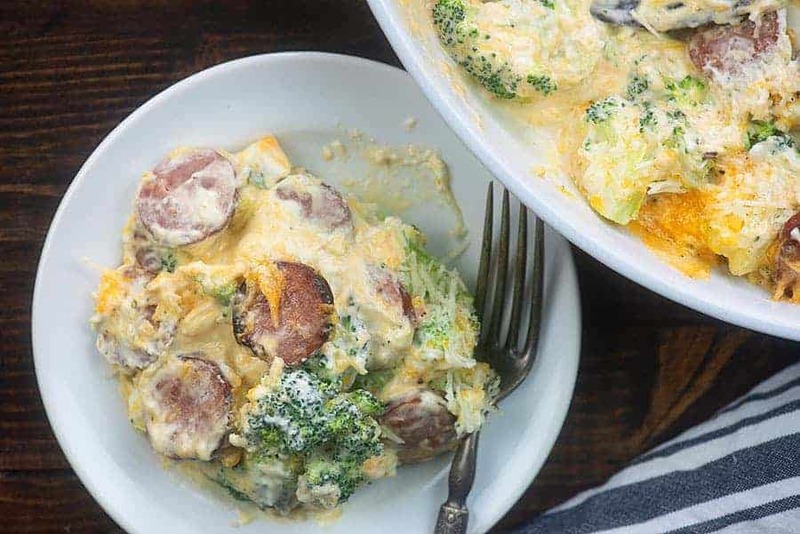 So, today we’ve got this broccoli cheddar casserole situation loaded with browned smoked sausage. It’s beyond easy and oh so delicious. You ready for the step by step? First, you’re going to want about 28 ounces of broccoli florets. I just buy the bag of florets, but you can definitely by a head of broccoli and chop it up yourself. I don’t recommend frozen broccoli for this recipe. Fresh is best, always. Add your broccoli to a large mixing bowl along with a couple tablespoons of water and cover it all tightly with plastic wrap. Microwave this for 2 minutes and then let it sit for 2 minutes to steam. If you don’t have a microwave or don’t like using plastic wrap in the microwave, you can do this on a stove top steamer. You’re looking for warm, barely cooked broccoli. We’re going to finish this in the oven, so don’t over do it. 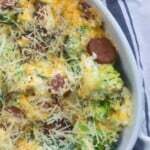 While the broccoli is doing it’s thang, slice up some smoked sausage and toss it in a hot skillet to brown. I like to get mine really browned on the edges, because it amps the flavor up majorly. Add some cream cheese, mayo, cheddar, garlic powder, and pepper to a mixing bowl and stir really well to combine. Dump that mixture over your hot broccoli and sausage and stir to coat. 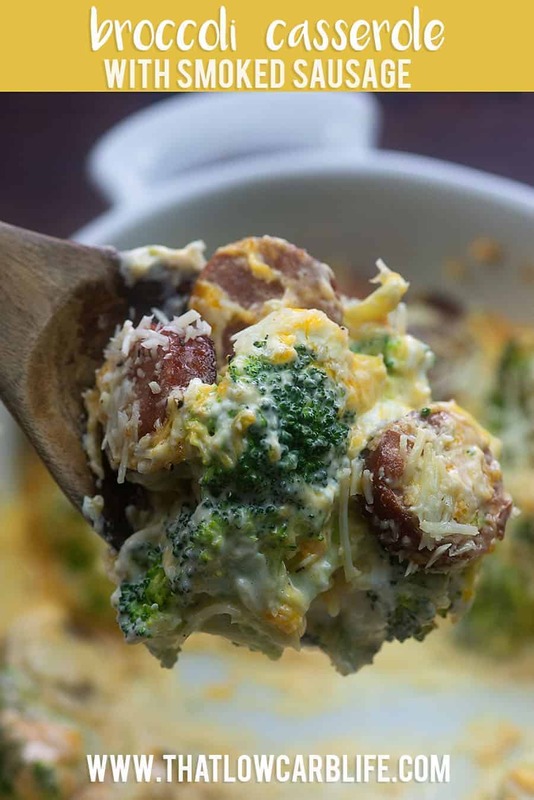 The cheese mixture is thick, but it should mix in pretty easily since the broccoli is hot. Pop all that in a baking dish, top it off with a sprinkle of Parmesan, and bake it up! If you love my broccoli casserole, you might notice that this is a riff on that recipe! 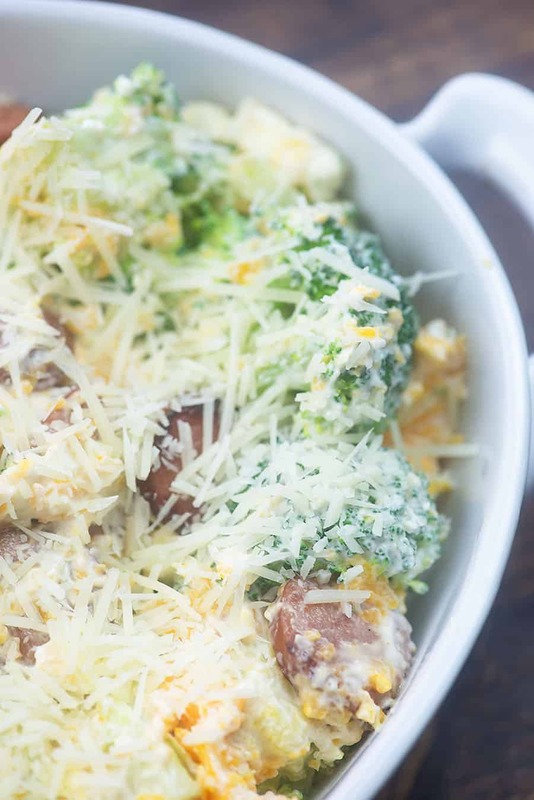 What comes out of your oven is a seriously gooey, creamy broccoli cheddar casserole loaded with bits of browned smoked sausage. I think I could eat this every day! Side dish or main dish? 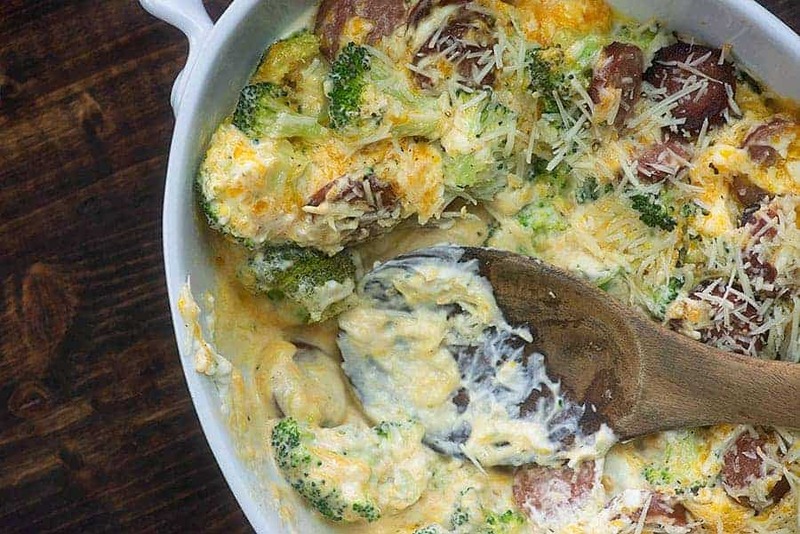 This recipe is pretty filling thanks to all of the cheese, broccoli, and sausage so you definitely could consider it a main dish. Just know that it also packs a lot of fat and is a bit carb heavy if you’re keto. What kind of smoked sausage to use? Smoked sausage comes in a variety of flavors and from many different brands. I was super surprised to see how many carbs are loaded in some of those sausages! 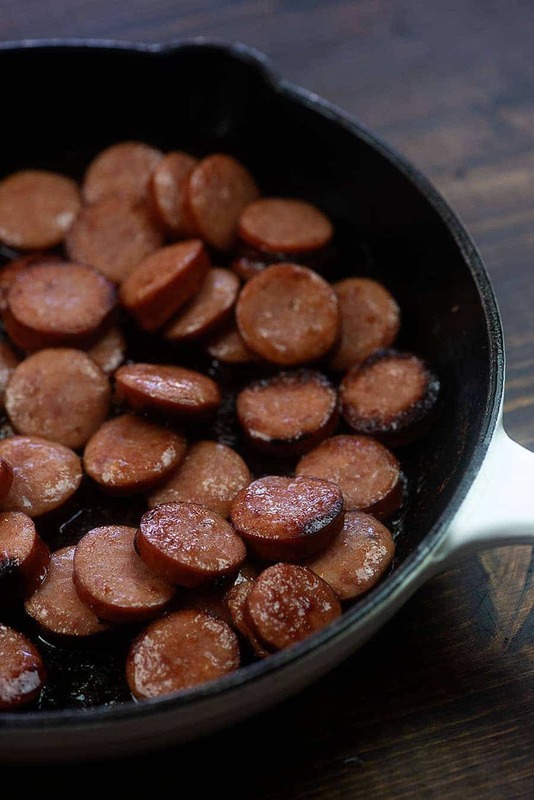 Hillshire Farm makes a smoked sausage with only 1 carb per 2 ounce serving and that’s what I use and how I’ve calculated the nutrition info for this recipe. It’s the lowest carb option I’ve seen and tastes great. 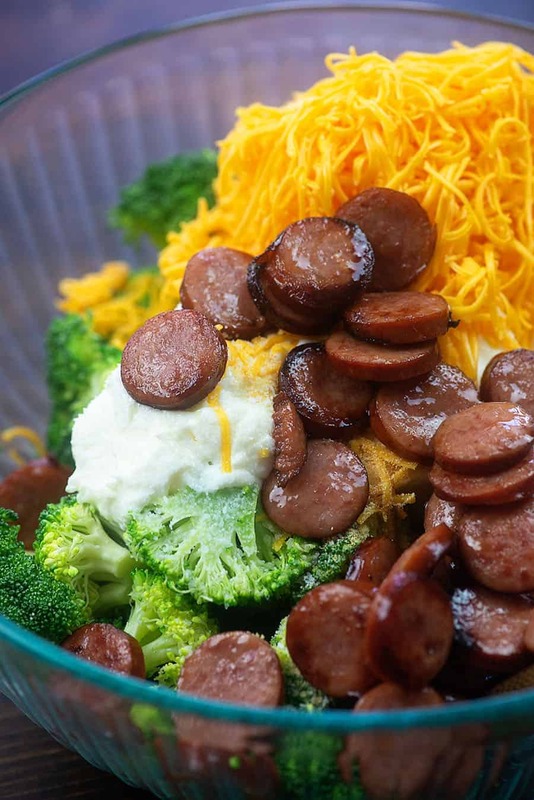 Broccoli Salad: Broccoli is my favorite veggie, if you hadn’t noticed! This broccoli salad is divine. Pulled Pork: I love a good slow cooker recipe and the sauce on this one is amazing. Lemon Chicken: Quick, easy, and so creamy and flavorful! Fathead Pizza: I topped mine off with BLT goodness! 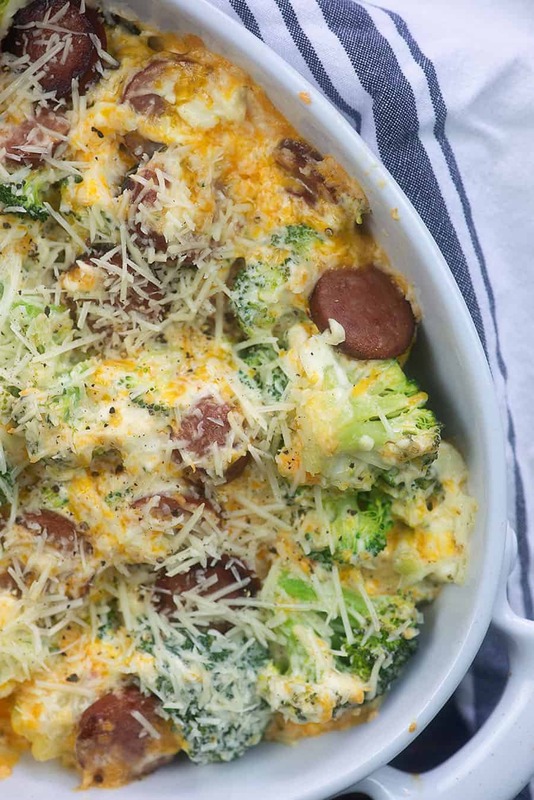 This broccoli casserole is extra creamy and cheesy and it's packed with flavor from browned smoked sausage. Transfer broccoli to an 8x8 baking dish and sprinkle the Parmesan over the top. Nutrition information is based on this serving 8 people as a side dish. If you'd like to serve this as a main dish, it should serve 4 people and you'll need to double the macros. I just discovered your recipes thanks to a friend sharing a FB post of this recipe. I cannot wait to try them all. I’ve sat here all night and read them and printed them while salivating uncontrollably! The love of casseroles and cheese and ranch is surely a midwestern thing bc i have it too! Thanks for the great new meals to try. Is anyone else having trouble believing that putting 28 ounces of broccoli florets along with all of the other ingredients will actually fit into an 8″ X 8″ pan? It cooks down after you steam it and mix it with the cheese, but feel free to use a larger pan. I put this dish in a 8-13 inch pan.. turned out very good..
Just made this last night. Unfortunately my gallbladder has decided that it hates my body and thr fat content here was just too much. However the taste was AMAZING! Hubby told me that we definitely have to keep this one on the frequent list! He is eating the rest of It and is happy about that while i am shedding a year. The broccoli needed more than 2 minutes to steam all of it for me and i did it in two batches. It did completely stuff an 8×8 dish after packing it down. If you used ever so slightly more ingredients you could easily make a 9×13. I also didnt brown the sausage. It’s fully cooked so not necessary and i cooked for 20 minutes to let the whole thing get bubbly and brown on the top. Maybe not cooking the sausage prior to making the casserole caused the problem with your gall bladder. All of the fat from the sausage was retained in your casserole. Precooking the sausage and draining before added to the casserole might help. Not sure, just a thought. I’m going to try this very soon. I would use ground Italian sausage instead. Cook in a separate pan, then put the cooked meat in a colander, rinse well under hot tap water to get rid of the grease, then add to the main pan with the broccoli. I would also forgo the cream cheese and mayonnaise – too much fat. I would use low fat sour cream instead. This was DELICIOUS! So fast, so easy too! This will definitely be on my regular dinner rotation! Thank you!! This looks good but I hate mayo and want to sub it out with something… suggestions? More cream cheese or maybe sour cream? I haven’t tried it with anything other than mayo myself. This was YUMALICIOUS! Since I’m cooking for one, I cut the recipe in half. Still cooked it in an 8×8 glass pan. Have plenty left over for a couple of lunches. Thank you for sharing your keto recipes. I added 1 tbsp butter, half a small white onion, chopped, and 2 cloves minced fresh garlic to the sausage mixture. I topped the casserole with parmesan and bread crumbs, which renders the dish not carb-free, but added a needed crunch. Delish! I don’t want the sausage I was thinking of doing it with Chicken,and low fat cheese and low fat cream cheese ,do you think that would be just as good . You can definitely swap in chicken. I don’t use low fat cheese, but if you like those products I think it would be okay. How much is a single serving? Like 1/2 cup or 1 cup? Just curious. I didn’t measure by volume. Just divided it out into 8 servings. Simply delicious comfort food! I made it exactly as written. Thank you! It was alright, I think next time I’ll use less mayo what the recipe calls for. I guess It’s because I hate mayo and I definitely tasted mayo lots of it. My whole family said this was “a keeper”. I love that it is quick and easy to make! Used my instant pot to steam the broccoli while the meat was cooking. For the broccoli is it 28 ounces by weight or volume? Can I sub cream cheese for sour cream? You could try, but the mixture might be a bit thick. This is delicious! A big hit here!!! !